Perlite and vermiculite are often combined in a 50/50 mix to provide a wonderful mix of growing media characteristics. Additionally, either the perlite (the white popcorn like particles) or the vermiculite (the darker, shiny material) can be used individually to lighten up other hydroponic growing media such as coir. 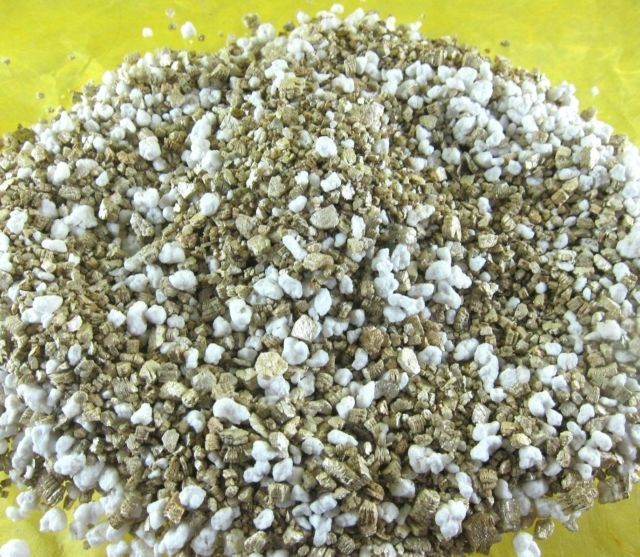 Perlite and vermiculite are very well known to conventional growers and gardeners, and are often included in soil mixes. I consider them together here not because they have identical properties, but because they are often combined in a 1:1 ratio for soil-less growing. It's a very attractive combination, but the combo has its pro's and con's like any other material. Vermiculite is a naturally occurring cystalline compound, which produces tiny flakes of brown-tinted,metallic-looking material. It is added by itself to heavy soils to lighten up the soil and improve drainage. It is chemically inert, so it will not change pH. It is also extremely lightweight, and relatively low cost. Perlite, on the other hand, is a man-made material which is something akin to popcorn. The parent material is mined and heated to very high temps, which puffs out the material to form small white hollow balls. They are virtually weightless, will float in water, and provide extraordinary surface area per unit mass. That means it can hang onto minute amounts of moisture to help smooth out the irrigation cycle. It is also chemically inert, so it will not affect pH. Neither perlite nor vermiculite can be easily recycled for reuse. Yet they are much less expensive than most other growing media. So replacement cost is not generally an issue. When these two materials are combined in a 1:1 ratio, they provide a lightweight, low cost, chemically neutral growing media that allow for both easily nutrient and air movement, as well as decent water retention over short intervals. The fact that most gardening centers, home improvement centers and even hardware stores will carry both ingredients nearly year-round, makes it even better. These materials don't get much attention compared to newer, flashier materials, but the combo is hard to beat for many different applications. The one disadvantage is that the perlite in particular can be rather dusty when first emptied from its packaging into your planting areas. Some folks wear a mask whenever handling it, and it needs to be washed down prior to first use. Once that has been done, it is dust-free. Perlite and vermiculite are both extremely common ingredients for both residential and commercial gardening and soil conditioning uses. Almost any home improvement store would carry both products at least seasonally, if not year-round. Many hardware stores, grocery stores and even drugstores will also carry both products at least seasonally. The only problem with buying from these sources is that they will typically sell these products bagged in very small quantities, such as 4 quarts or less per bag. Furthermore, those retailers will generally have the highest per-volume pricing of any supplier. Those quantities very quickly get prohibitively expensive when used as growing media for even a moderately sized hydroponic project. A second option is to buy these materials in bulk from commercial nursery or landscaping supply houses. These suppliers will offer the quantities you need, at much lower per-volume prices than any local hardware store or home improvement center. A third option is to check online hydroponic retailers. Both products are popular enough, and lightweight enough, to have low online pricing and relatively low shipping costs. Most grower supply and gardening supply companies will have both products in various package sizes. For example, the Greenhouse Superstore sells a variety of perlite and vermiculite products as part of their growing media assortment.